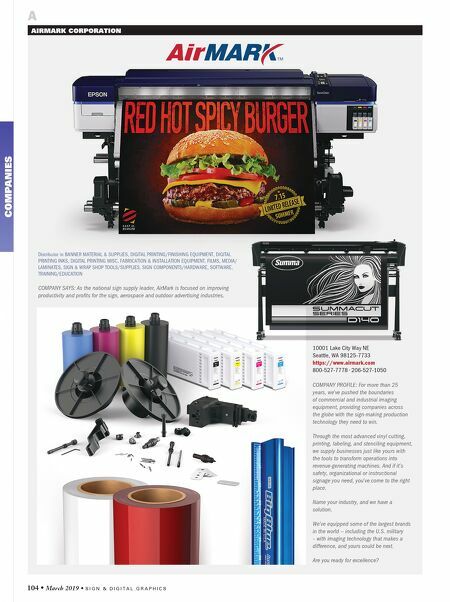 S I G N & D I G I T A L G R A P H I C S • March 2019 • 105 AGFA GRAPHICS Manufacturer in DIGITAL PRINTING/FINISHING EQUIPMENT, MEDIA/LAMINATES, SCREEN PRINTING EQUIPMENT/SUPPLIES, SOFTWARE COMPANY SAYS: Agfa helps you produce more powerful messages that are attractive, affordable and profitable. We offer a comprehensive portfolio of innovative digital printing equipment and products, and integrated service to help you be more profitable. 611 River Dr Center 3 Elmwood Park, NJ 07407-1325 http://www.agfagraphics.us 201-440-2500 AI INNOVATIONS Manufacturer in AWNING SYSTEMS/SUPPLIES/EXTRUSIONS, ELECTRONIC SIGNAGE (LED/ NEON), SIGN COMPONENTS/HARDWARE COMPANY SAYS: AI Innovations helps you reduce your overhead and increase profits on your signage projects. Manufactures wholesale channel letters, custom signs, sign cabinets, decorated faces, Slimbrite letters, awnings, digital printing and laser-cut acrylics. 11899 Exit 5 Pkwy Fishers, IN 46037-7938 http://www.aiinnovations.com 877-352-8014 AIRMARK CORPORATION (SEE LISTING ON PAGE 104) ADVERTISING IDEAS INC Distributor in SIGNAGE DISPLAY/EXHIBIT SYSTEMS COMPANY SAYS: Quality promotional products for less. Wind dancers, giant inflatables, feather flags, custom flags, table covers, custom tents and trade show displays. 7703 Densmore Ave Van Nuys, CA 91406-1920 http://www.inflate.net 800-778-2675 • 818-988-8660 AEC WHOLESALE ENGRAVING Manufacturer in WHOLESALE - (TRADE ONLY) COMPANY SAYS: Wholesale producer of ADA and engraved signs. 567 W Golf Rd Arlington Heights, IL 60005-3904 http://www.aecengraving.com 847-621-2628 AEROTECT Manufacturer in FILMS, WHOLESALE - (TRADE ONLY) COMPANY SAYS: AeroTect is the California 3M training and distribution center for 3M automotive films. We provide paint protection film and wrap vinyl to installers throughout the state. 1935 McKinley Ave # F La Verne, CA 91750 http://www.aerotect.net 909-596-0053 A email us at info@gfpartnersllc.com to find a dealer near you. 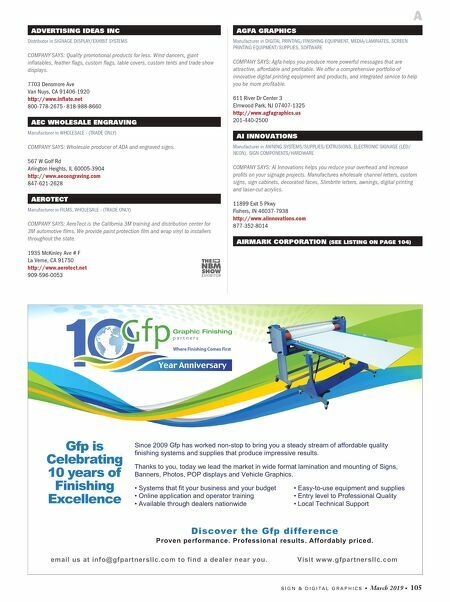 Visit www.gfpartnersllc.com Gfp is Celebrating 10 years of Finishing Excellence Year Anniversary Where Finishing Comes First Since 2009 Gfp has worked non-stop to bring you a steady stream of affordable quality finishing systems and supplies that produce impressive results. Thanks to you, today we lead the market in wide format lamination and mounting of Signs, Banners, Photos, POP displays and Vehicle Graphics. • Systems that fit your business and your budget • Easy-to-use equipment and supplies • Online application and operator training • Entry level to Professional Quality • Available through dealers nationwide • Local Technical Support Discover the Gfp difference Proven performance. Professional results. Affordably priced.